A few years ago a friend of mine turned me on to flavoring foods with fried sage leaves. At first I wasn't sure what to make of her theory, but then I started doing it myself and was totally stunned. Fried sage can be stirred into so many things and adds terrific flavor to all kinds of foods. Once I got into the rhythym of using it I couldn't stop. Now I consider it one of the most useful herbs in my garden. Here are ways you can use fried sage in your cooking. The earthy, musty flavor will transform so many of your favorite dishes into so much more! Read on for some ideas for recipes with fried sage. Risotto: Chop fried sage and stir it into rich risottos. It pairs especially well with sweet flavors like pumpkin, butternut squash, and sweet potato. 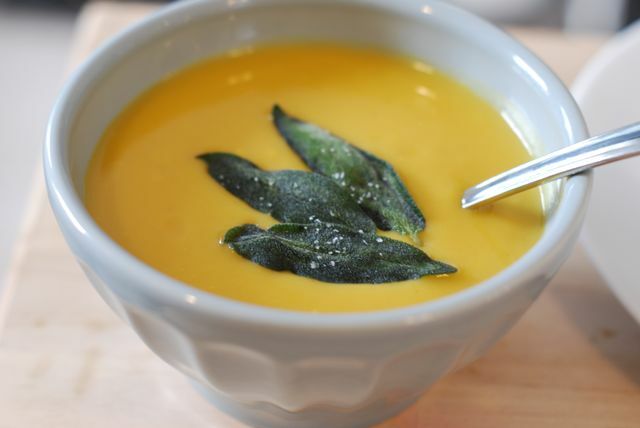 Soup: Sage makes a terrific soup garnish because it lends just the right amount of flavor the broth. Try it with butternut squash, mushroom, or minestrone soup. Sandwiches: One or two fried sage leaves go a long way. Add it to a baguette sandwich when you need a little extra oomph. It also adds unique flavor to burgers and chicken sandwiches. Pasta: The richness of fried sage adds instant flavor to creamy sauces like alfredo or vodka sauce. Meats: Fried sage is often paired with cheeses and breads and used to make a flavorful stuffing for meat or peppers. A friend of mine turned me onto fried sage---and now I'm hooked! Step 1: Trim the sage leaves off the steam. Set aside. Step 2: Warm the olive oil over medium-high heat until hot, but not smoking. Step 3: Add about 8 leaves and fry for 5 seconds per side. They will darken and stiffen up. Watch them carefully so they don't burn. You will know they are ready when they are flat across the tines of a fork and you smell a burst of sage in your kitchen. Step 4: Remove the leaves to a plate with a paper towel to drain. Sprinkle with salt. Repeat with remaining leaves.